Direct daughter of Buckeroos Top Cat!!!! 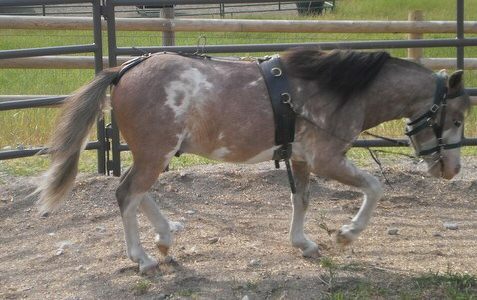 Her dam is Hobby Horses Little Belle. 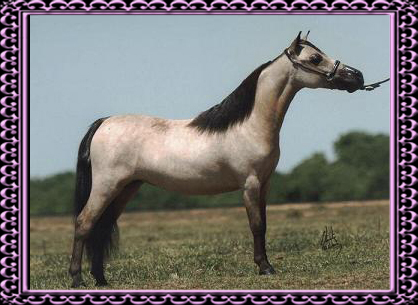 This is a beautiful outstanding mare. We showed her and won many top awards with her. 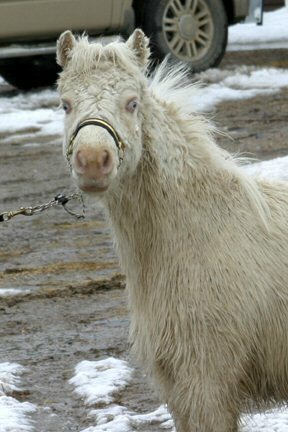 Watch for her foals, they are really nice. 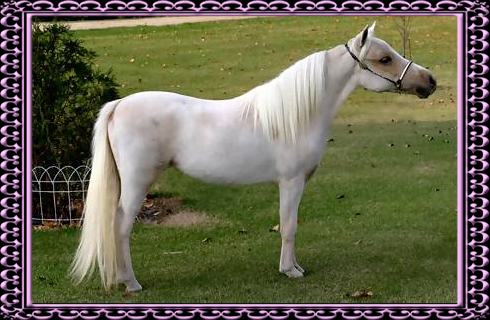 LOUD OVERO coloring to complement your buckskin mares, then consider "ZEPHYR WOODS BTU PLATINUM EAGLE", a loud frame overo buckskin stud (mane & tail are turning black) next year as a breeding stud too. 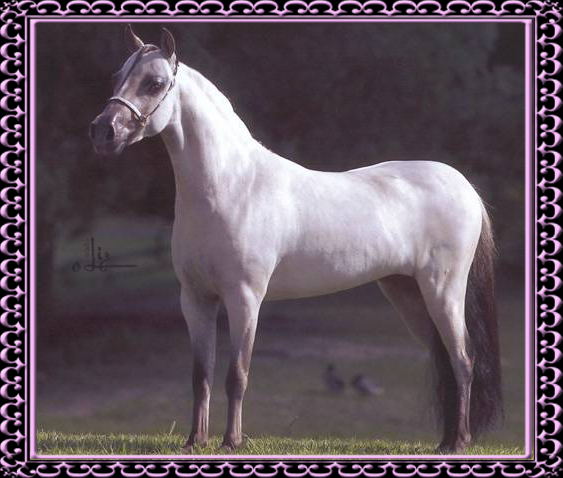 BTU with Six Generations of Loud Overo in his pedigree. What do you think?? COLOR! COLOR!! He tested n0,nSb1,Ee,Aa,nCr,nZ. 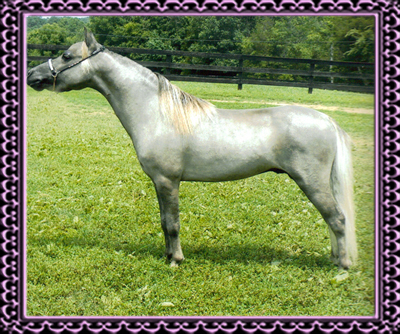 He is considered a silver buckskin with both Frame and Sabino Patterns, along with Agouti and Creme! 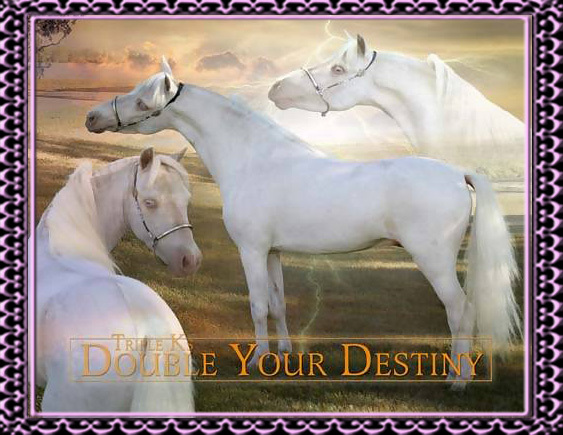 His sire (LTDs White Eagle) is a direct son of multi-AMHR National Champion LTD's Magic Man. 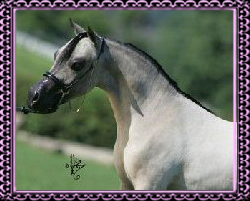 The well known "Magic Man" is a loud black and white medicine hat overo. 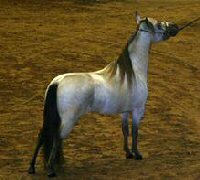 He has won 19 National Championships with winning both in halter and yet has the fabulous movement of a driving horse while winning national titles for driving also, including titles for Color too. Magic Man was also named a Superior Sire. As you can see, our "Eagle" has a history of champion pedigree in his background with White Eagle, Magic Man, the famous "BTU" and Top Cat and Boones Little Buckeroo!!! 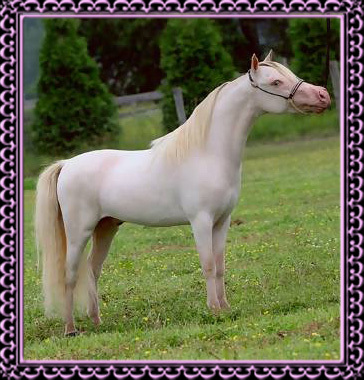 WHAT BETTER PEDIGREE COULD A HORSE HAVE WITH COLOR...CONFORMATION...AND MOVEMENT!!!!!!!!!! THERE IS ONLY ONE REASON HE IS BEING OFFERED FOR SALE. 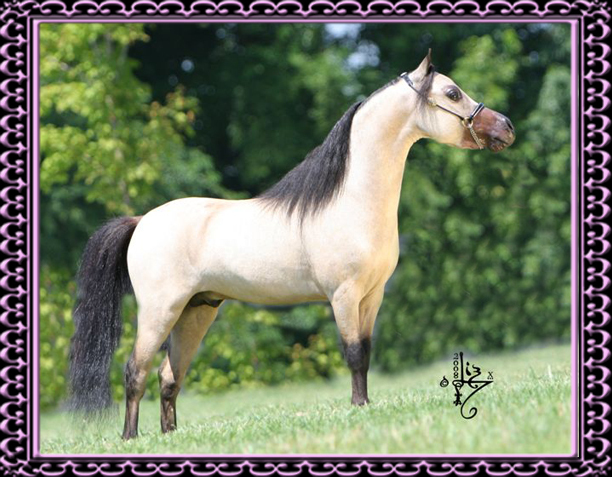 We have solid buckskin mares and are planning to cut down on our workload along with some life changes, and just decided we don't have enough mares to go to all the studs to help promote the stallions as they should be. So we have regretfully decided to offer PLATINUM EAGLE FOR SALE. He measures in at 32.50 inches and is two years old. 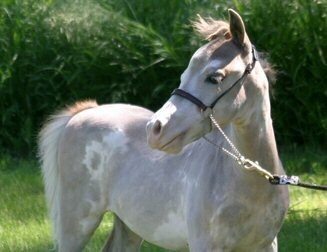 HOW OFTEN CAN YOU PURCHASE A HORSE OF THIS COLOR--WITH COLOR, CONFORMATION AND PEDIGREE THAT IS WELL KNOWN ON BOTH SIDES! AMHA and AMHR registered. SOLD! Congrats to Jason and Heidi Goebel. This stud will certainly put lots of color in your herd!!!! 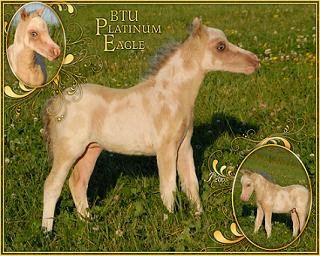 Zephyr Woods BTU Platinum EagleClick herdd text. LOOK HERE EVERYONE!! Do you want class, style, color, conformation and pedigree all in one? 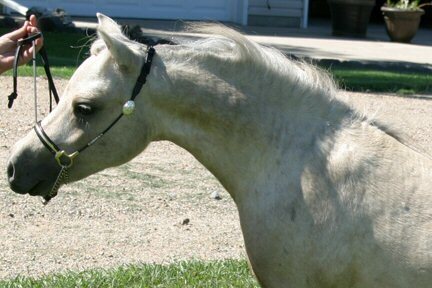 Look this filly over, she was born dark dark golden and her mom gets golden in the summer so we believe she will too. She is fancy, which you can tell by looking at her. Her dam is Owens Buckeroo JJ, a direct daughter of AMHA WORLD CHAMPION "BTU" and her sire is our beautiful "Collectable Medalion". This filly will show, as all this mare's foals show. 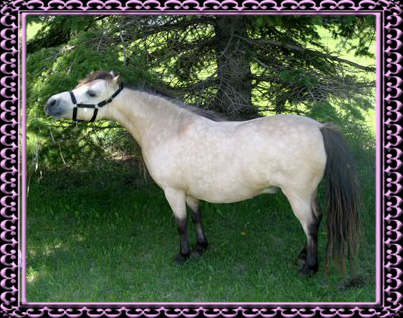 Click on the mare page and click on JJ's photo - you will see all her offspring. They are all beautiful and win win win in the ring!!! This filly is double registered and canon was 7.50". SOLD! Another awesome purchase by our good friends from JD Diamond Acres in Idaho, Jennifer & Dan Hinkley! I don't know if I could pick just one of my favorites this year, but this little perlino?/cremello? 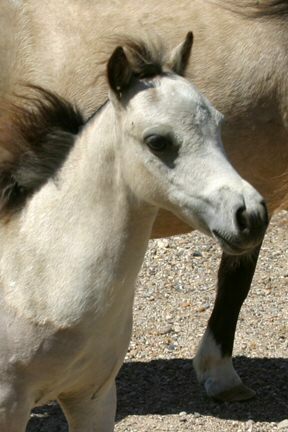 filly is one of the top foals. WOW! 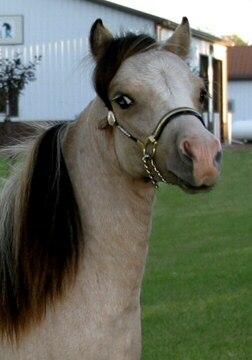 Do I love this filly! 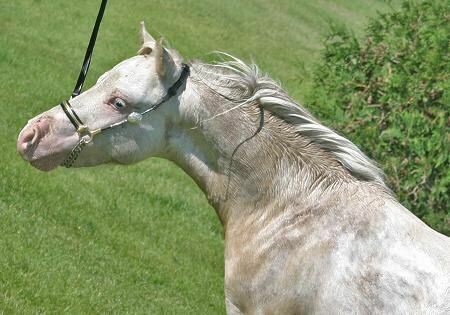 Look at her attitude, and now you see more and more show horses in the ring of this color. This filly has to be good. Her dam is a direct daughter of AMHA WORLD CHAMPION "BTU" - BTU Sparkles - and her sire is our Buckeroo son, "Boogie Buckeroo". LOOK AT THIS HUGE EYE, a rarity for a perlino!!!! What more could you order in a filly? She has it all. Her canon was 7.5 and she will be double registered. 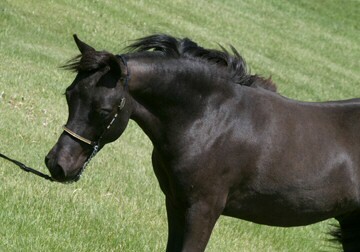 This is another of those intense Buckeroo-bred foals, with Buckeroo on both sides. 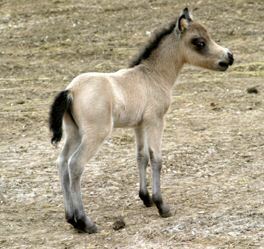 HERE IS THE FOAL MANY OF YOU HAVE BEEN ANXIOUSLY AWAITING, and it was worth the wait. 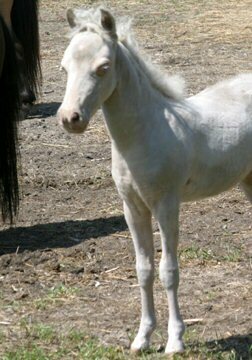 A BEAUTIFUL TINY REFINED PERLINO FILLY. Does the name, TRIPLE KS BOOGIES ECHO MAN ring a bell?? Well, here is his FULL SISTER--same color...same PERFECTION. 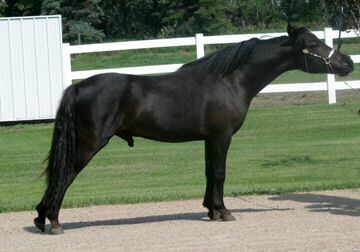 Her sire is Little Kings Boogie Buckeroo, a direct son of Boones Little Buckeroo, National GRAND Champion Senior Stallion. 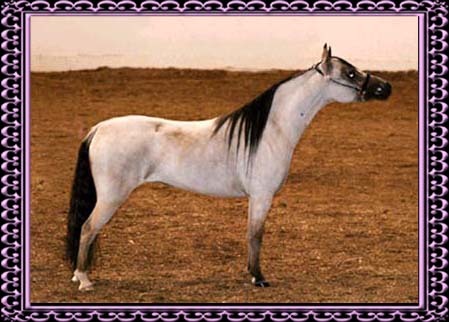 Her dam is Alamos Buck Echos Feverete, a daughter of Little Kings Buck Echo, National GRAND Champion Senior Stallion and National Reserve GRAND Champion Junior Stallion, who in turn is sired by Boones Little Buckeroo. This makes this special little filly a double bred Buckeroo package. We crossed this same way due to the excellent foals that have some from this cross. 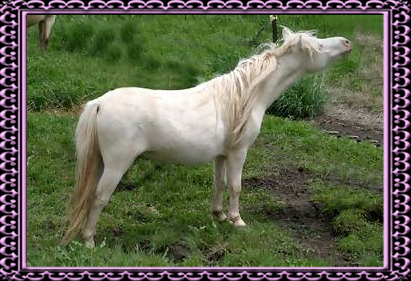 This mare has foals in many many countries, and they are all well known in their country too!!!!! Echo Man is going out to show this year on the AMHA circuit. 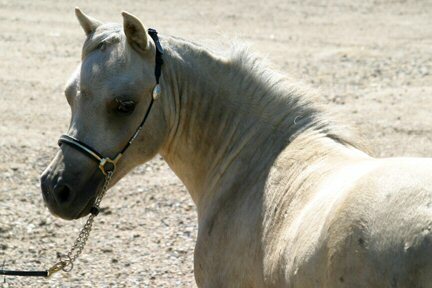 Here is a filly that doesn't come along very often. With all these special attributes, this may be the filly for you. Canon was 7.5. 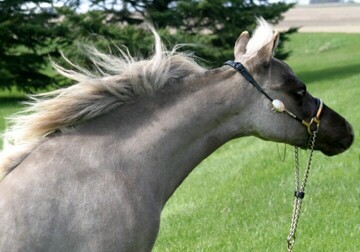 We just bought back a full sister to this little miss last fall for our breeding program. JD Diamond Acres in Idaho! 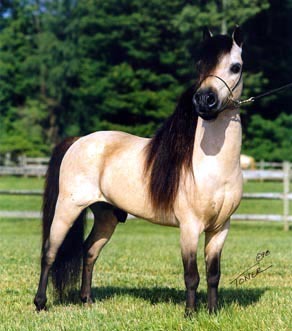 MANY MANY breeders know several of the offspring from this mare. 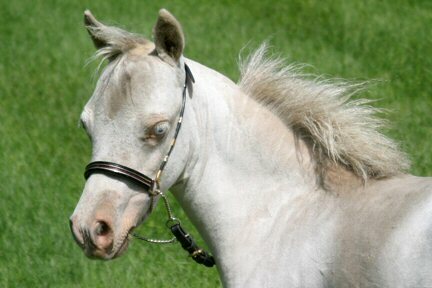 People have been in line for her foals a year ahead at times. She never lets us down. Feverette is a direct daughter of AMHA World Champion Little Kings Buck Echo and she is the dam of well known Triple Ks Boogies Echo Man owned by Monette Freeman. 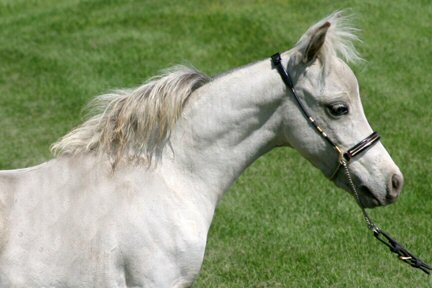 This mare is the dam of Triple K Boogies Pride of Dakota, and many many foals overseas in different countries. 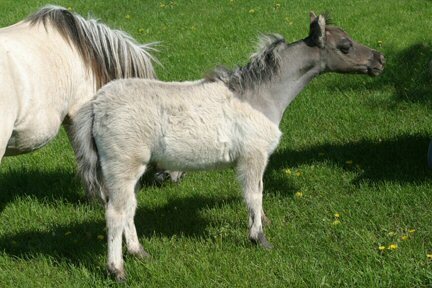 We bred her to Joker this year for the first time just as an experiment and this foal is as good as any in her past. 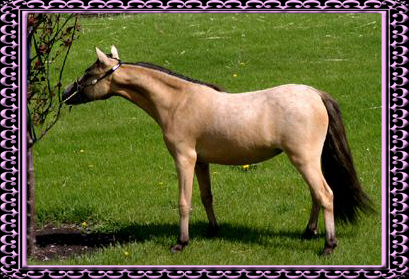 This ultra refined buckskin filly has that attitude that is special in the showring, and so correct, upright neck, long long neck, great topline. Look at her closely. DID YOU WANT BUCKEROO??? 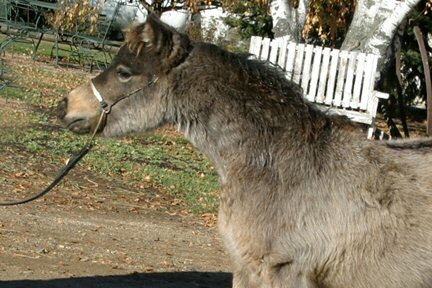 We bred a BTU daughter, Beauty Blue, to our Buckeroo son "Boogie Buckeroo" and this is what we are getting. We love this cross. Of course if you look at our mares, we have a lot of BTU daughters. 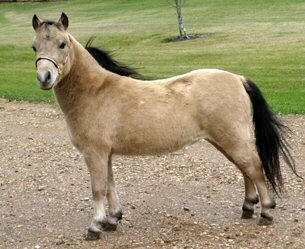 This little buckskin stud is really nice. As far as pedigree you can't get much better than this!!! 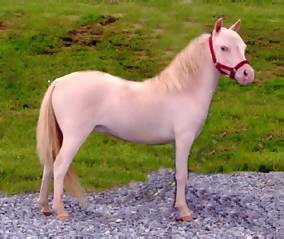 This little guy is fancy, moves like a dream and would surely make an excellent show horse. 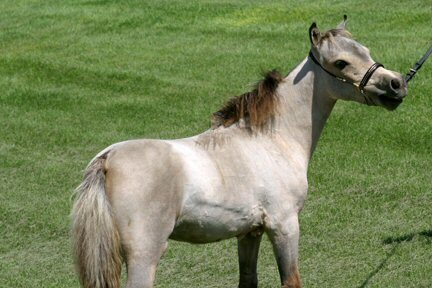 This guy has that buckskin color, the pedigree to market your foals, and the looks to prove himself a winner either way. He is double registered and his canon was 7.75. 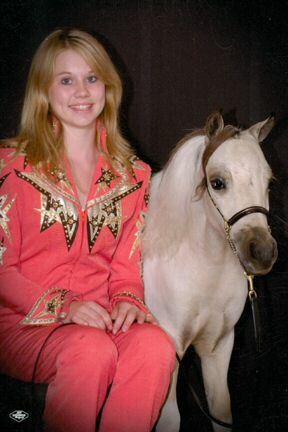 Congrats to Allison Keaton from AK Victorian Miniature Horses! DO YOU LIKE GOLDEN PALOMINOS??? 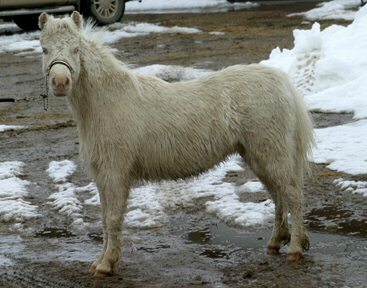 Yes,that is what this beautiful, tiny, refined filly will be. Her dam is Belingo, a special direct daughter WORLD FAMOUS BTU. 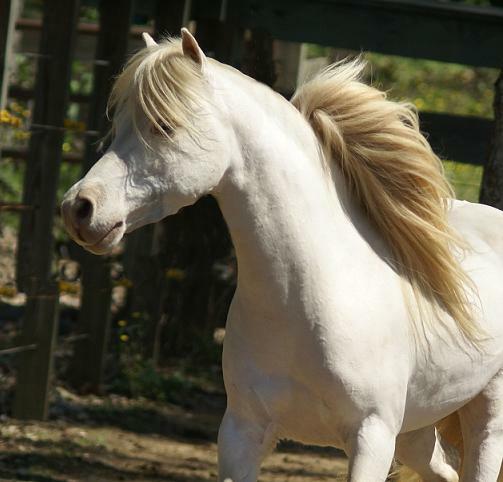 Her sire is our beautiful World Reserve Champion "Joker". 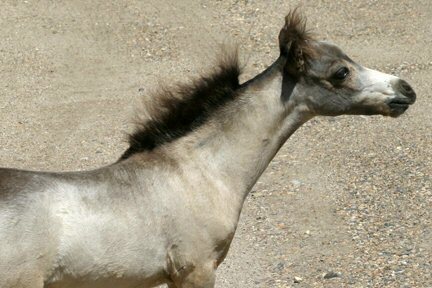 This filly has a 7 inch canon and what a neck and head. 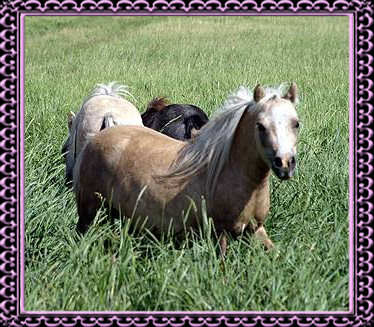 We love our Boones Little Buckeroo Too daughters, they are pretty precious to us, and as most of you know, he is no longer siring foals. 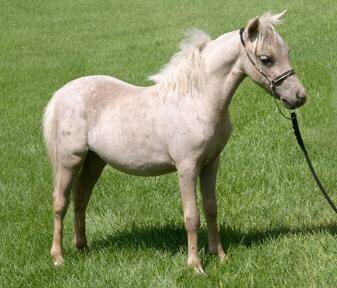 This filly has another world champion breeding behind her. 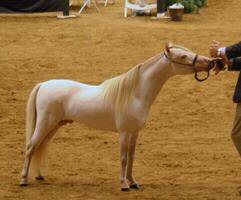 Her dam also has World Champion Buck Echo in her pedigree, too. Think this over. These golden palominos are hard to find in the miniature world. Don't you want to own this one? Double registered. Congrats, Frank and Kathleen Sutton from Double Tree Miniatures, Montana. 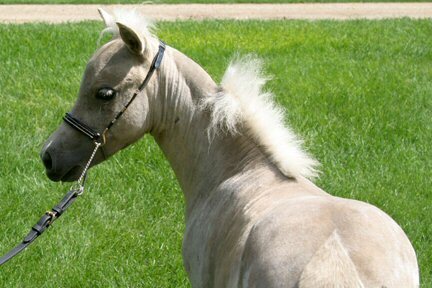 This is one adorable filly. 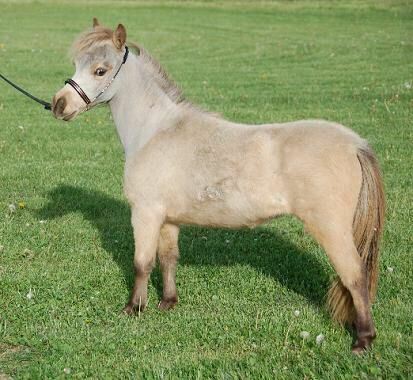 LOOK at this tiny tiny stud colt. 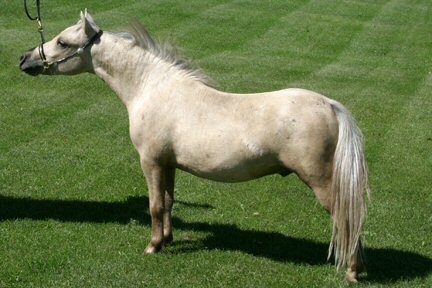 He is a buckskin/dun as he has a dark dorsal stripe, and tiny star. 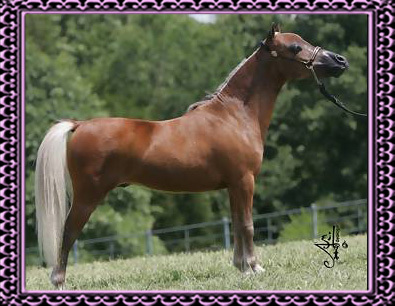 Dam is our AMHA WORLD RESERVE CHAMPION MARE "Triple Ks Boogies Heavenly Angel", whose dam is our MULTI AMHA WORLD CHAMPION MARE "BTU Sheza Dandy". This little guy is something special. 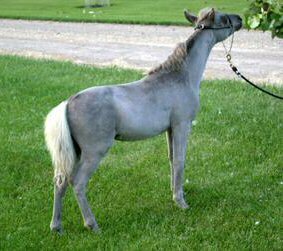 He was born with lots and lots of hair, so you have to believe his quality is under that hair.He has that buckskin and the pedigree with conformation all in a TINY package. His canon was barely 7 inches so he will stay small. 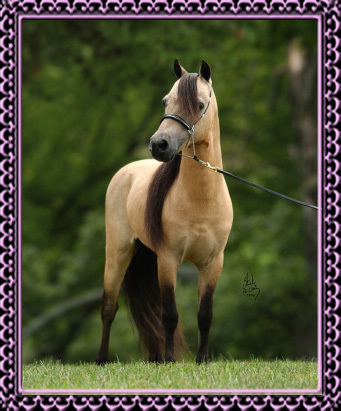 His sire is our beautiful buckskin stallion Joker. 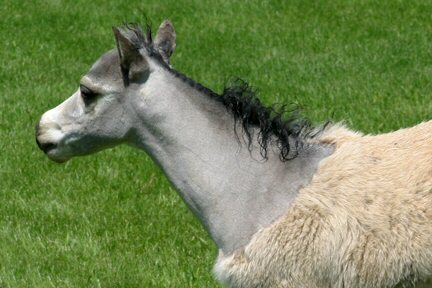 We love these Joker foals, and this foal has all the Buckeroo you need plus Joker as the outcross. Congratulations to Teresa Isbell, Shadowed Moon Miniatures, New Mexico. 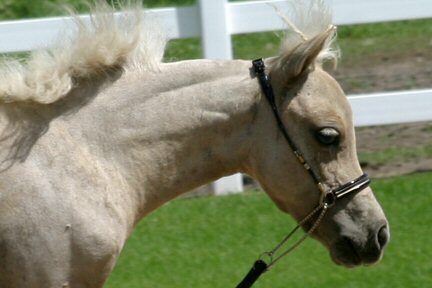 This little guy has it all buckskin color and pedigree. 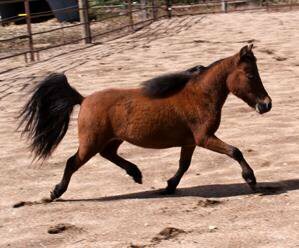 This beautiful little stud colt will stay about 30 inches. He is out of our Boones Little Top Cat daughter and "No Laffin Matter" aka "Joker". 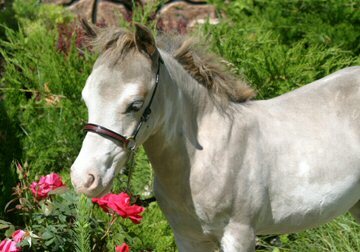 This is Joker's first year of foals, and wow! We love them and think you will too. This little guy is so sweet, quiet and lovable. With this pedigree you can show and then use him for breeding. Think seriously about him - he is a doll. Double registered!! 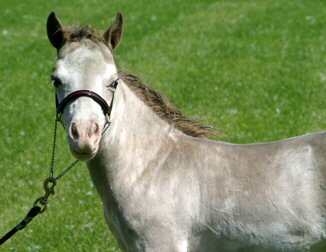 Take a closer look at this beautiful silver buckskin stud colt, and you will see the carefully thought out breeding program behind him. This is one of our first crosses again, along with Rumor's foal with using Collectable Medalion with our Buckeroo Bred mares. 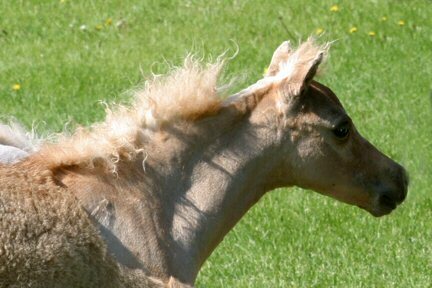 Study the head, the length of neck and the level topline...we really like this foal. 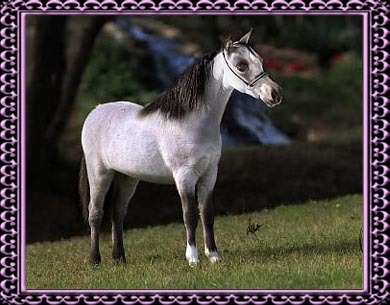 His dam, Buckeroo JJ, is a direct daughter of WORLD FAMOUS BTU and if you want to see the great foals this mare has produced, click on the mares photo and up will come some tremendous foals. He was born April 16th and canon was 7.5". AMHR/AMHA registered. BTU SHEZA DANDY-Multi AMHA WORLD CHAMPION is his dam.Sire is ALLIANCE IM CINSATIONAL TOO-AMHA WORLD CHAMPION! 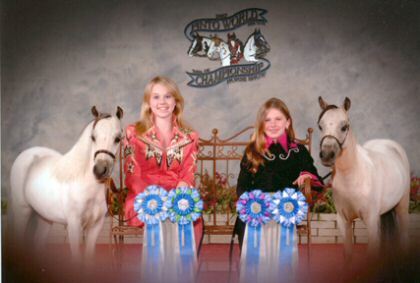 Legend's sister carries the title of AMHA WORLD RESERVE CHAMPION-her name is BTU BOOGIES HEAVENLY ANGEL!!!!!!!! 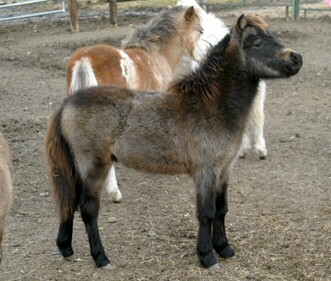 Now his full sister is on her way to ALLIANCE MINIATURES to hit the 2011 AMHA Circuit! 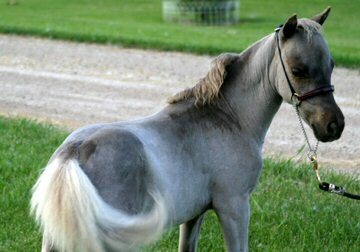 Legend is beautiful, a silver Grullo, dark dorsal stripe, dark head and dark legs, silver mixed in mane and tail due to his dam's silver buckskin coloring. This would be Legend's show year, he should show under 30 as a three year old stallion. He was used for breeding last year and has 4 mares in foal to him! Tiny tiny chiseled head, large eye, tiny tiny ears and as straight and correct as you will find. Grandsires on both sides are also World Champions! WOW!! 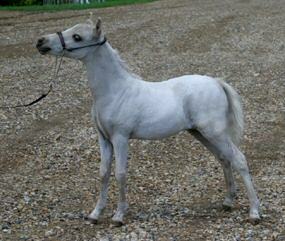 He is very tiny boned, has that long archy neck, level topline, beautiful shoulder and good square leg set. He is as correct as you would ever find, plus carrying that unusual coloring. 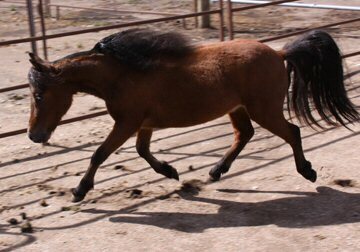 Here is a coming two year old really dark red bay stallion ready to come to you for a great breeding program. 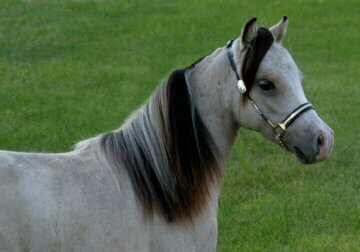 His dam is one of our best mares, Alamos Buck Echos Feverette. 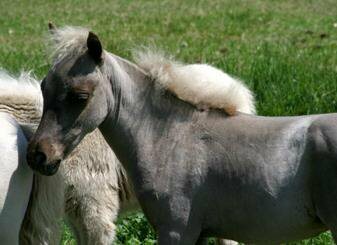 She has foals in about 5 countries, and they love them all. We even bought back one of her daughters for our breeding program-Pride of Dakota. 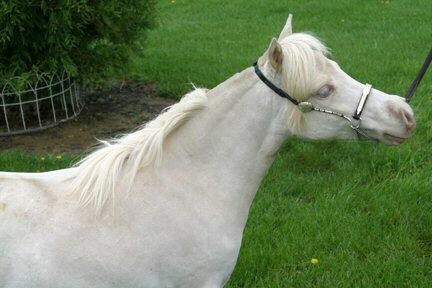 This little boy is the same cross as the famous Triple Ks Boogies Echo Man that most miniature breeders know about and saw him at the World Show. 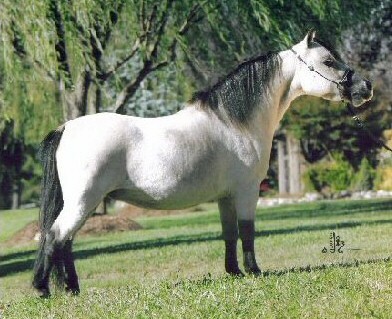 This mare has produced many many show foals. We are offering a great price on Mr Echo. He is about 30 inches tall and a real sweetie. 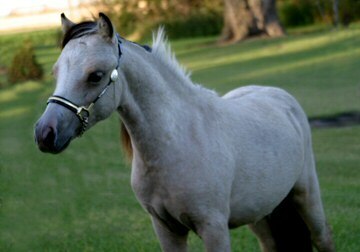 His sire is our well known tiny perfect Buckeroo son, Little Kings Boogie Buckeroo. With his dam a daughter of the AMHA World Champion, Little Kings Buck Echo, the story is pretty easy to figure out the future of this little bay stud colt. And look at the way this guy moves! LOOK!! LOOK!!! LOOK!!!! 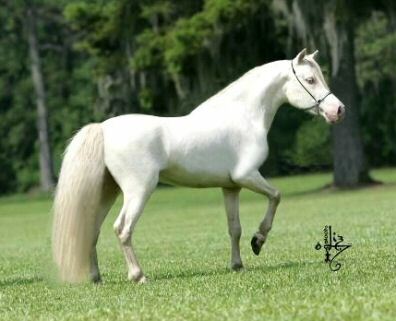 COLOR...PEDIGREE...BEAUTIFUL! Take a good look at these photos just taken at less than one week old. This guy was planned and we are pleased to say this is exactly what we expected. His dam is Little Kings Rumor Has It Buckeroo, a DIRECT DAUGHTER OF WORLD FAMOUS--Boones Little Buckeroo and out of a WHITE RUSSIAN DAUGHTER. This means total BUCKEROO and his sire is our own Ravenwood Collectable Medalion. Look at the style, class and elegance in this little guy!! Canon was 7.75 and he will be double registered. OK--Look here everyone! 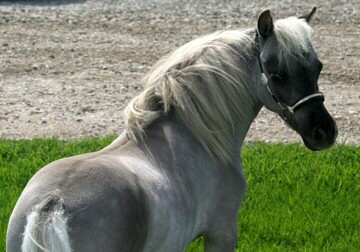 This tiny little mare is beautiful, even though her photos did not do her justice. 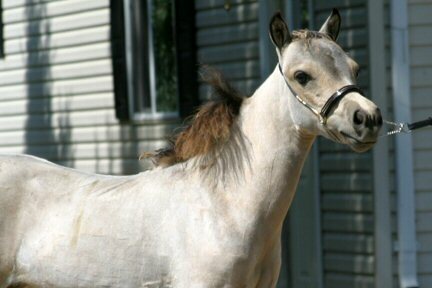 Empress was born in 2006, she had her first foal in 2009 breed to Ravenwoods Collectable Medalion!!!! We are excited for her to prove her producing ability and for Collectable (Melvin) to show the world of his ability to sire offspring as outstanding as he is!!! Empress is royally bred. Her sire is none other than the famous Hunt House Farms Medalion by Lucky Four Wranglers Buccaneer and her dam is Sweetwaters Sierra Dawn. 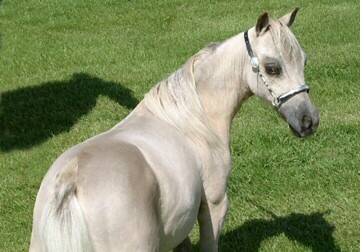 This mare is a daughter of the famous Medalion and Collectable is a son of Medalion. Direct daughter of BTU!!!! 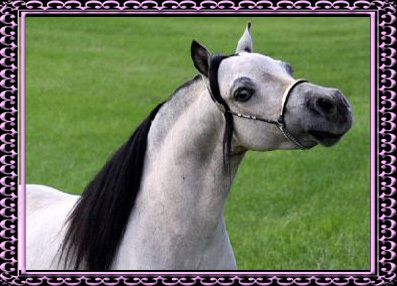 World Grand Champion Senior Stallion, World Grand Champion Get of Sire; Envi Me's dam is also a direct daughter of Boones Little Buckeroo, Little Kings Sheza Buckeroo!!! Envi Me is a cremello and stands only 31.00 inches tall. 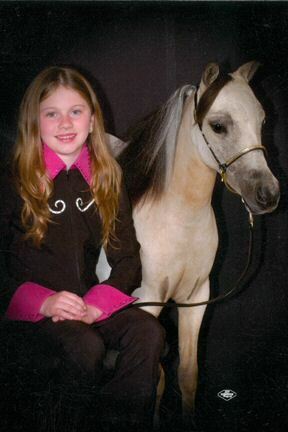 She was born in 2002 and is a beautiful mare. Bred for 2011 to Collectable! 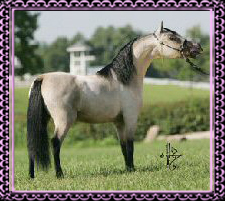 AMHA WORLD CHAMPION He is a beautiful stallion, his dam is owned by Alliance, Aint She Cinsational and is a WORLD CHAMPION, sired by Solid Gold Sensation, and his sire is Steppin Out, World Champion. 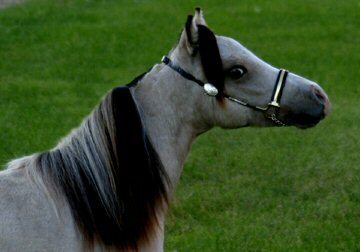 Cinsi's grandsire is the famous GLENNS GENERAL PATTON! 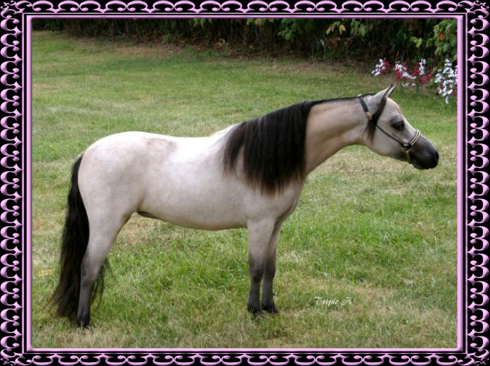 Cinsi has proven himself in the miniature world by already siring absolutely beautiful foals that already are winning in the show ring and will be sought after world wide. 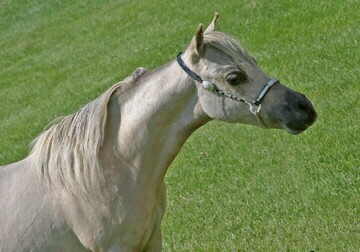 He is a proven stallion, sire several buckskins and golden palominos. 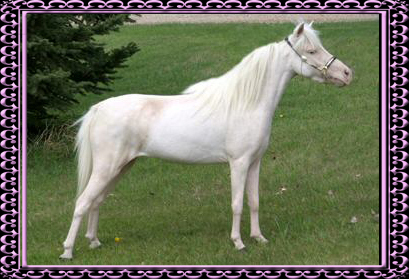 Alliance Im Cinsational Too is a one of a kind stallion, tiny tiny body, beautiful head, long neck, perfect topline. A proven winner, already World Champion. Hang Em High Ranch. Cinsi is in Montana. Boogie, Boogie, Boogie, he did it again!!! 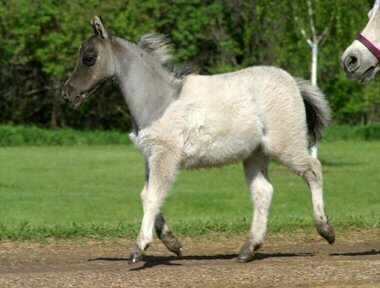 This is a beautiful typical Boogie Buckeroo foal. 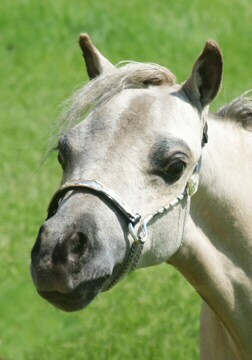 Boogie is our 29 inch DIRECT SON OF BOONES LITTLE BUCKEROO!!! 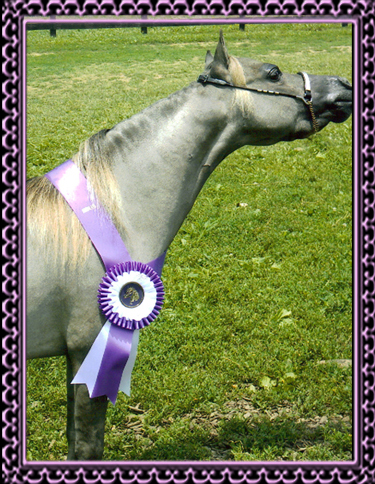 Boogie is known for some top AMHA and AMHR Show horses!!! 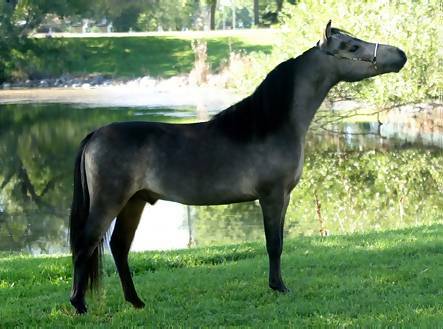 He has sired an AMHA WORLD RESERVE CHAMPION along with the well known perlino stud "Triple Ks Boogies Echo Man". 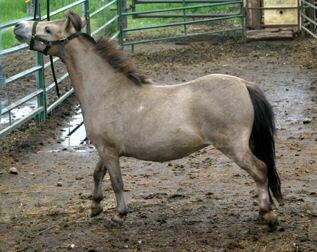 This stud is just as good, not sure of his color, we feel he will follow his dam, and become a sooty buckskin. But LOOK AT THIS GUY'S PEDIGREE!!!! His dam is Zephyr Woods Russians Star Lady. 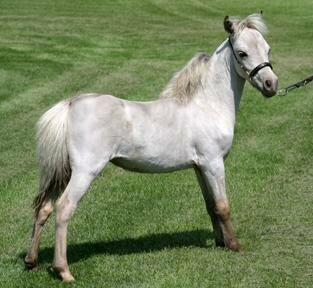 She is a direct daughter of Little Kings White Russian (who is a triple bred Buckeroo son) and also has Buckeroo on her top side. Then we bred her to Boogie, and this is the final product!!! This guy is almost pure Buckeroo!!. His canon was 7.5" when he was born. 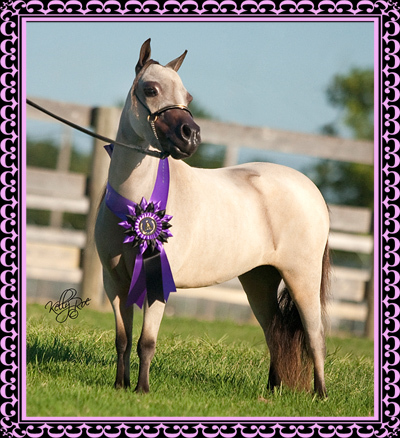 Look here, World Champion BTU and World Champion, Alliance Im Cinsational Too, beautiful silver buckskin yearling at just 27.00!!! His full sister started out this same way. 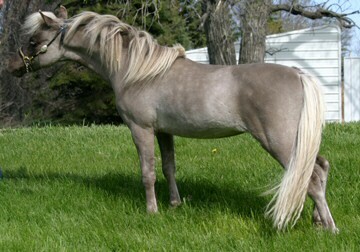 His ears are dark, and lots of dark hairs in his mane and tail. 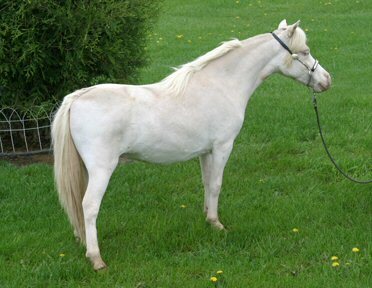 His dam is another one of our top BTU daughters, "LK BT Crystal Lady" (a cremello mare that really has nice foals). She is carrying the Buckeroo lines several times in her pedigree!!! Then what did we do? 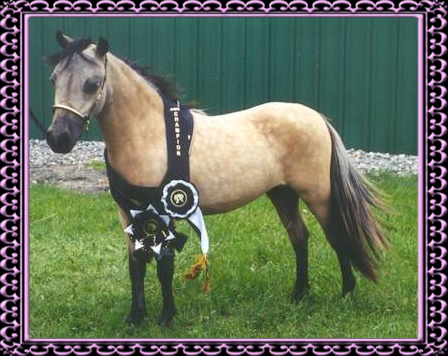 We bred her to our AMHA WORLD CHAMPION "Cinsational" and this is the result, and this is what we expected. Crystal did not let us down. His canon was only 7 inches, so he will stay small. 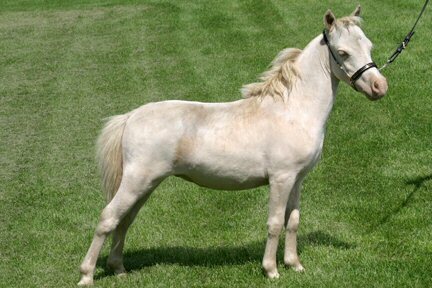 So to recap---buckskin---tiny-refined-pedigree---He will be a tremendous stud!!! We love this cross of Buckeroo/Cinsational!!!!! SOLD! Congrats to Frank and Kathleen Sutton. He is a special little stud and has the quality people are looking for. 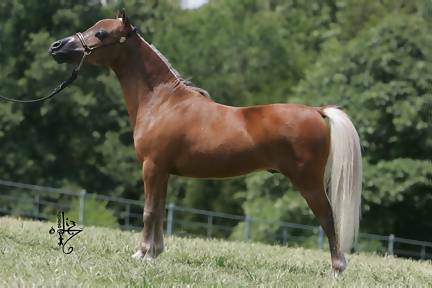 His dam is "Rumor has it Buckeroo", a DIRECT daughter of the famous "Boones Little Buckeroo". His sire is AMHA WORLD CHAMPION "Alliance Im Cinsational Too", so this tells us the guess work is done on this special package. We feel he is a smokey coloring at this time, will have him color tested, but we are sure he will have the creme gene. He does have a dorsal stripe, tiny tiny baby doll head, long long slender neck, and beautiful top line and high tail set that we breed for. Canon is 7.5 and is double registered. SOLD! Congrats to Connie Ambers of North Dakota. SHOW FILLY This filly has the tiniest bone structure ever. 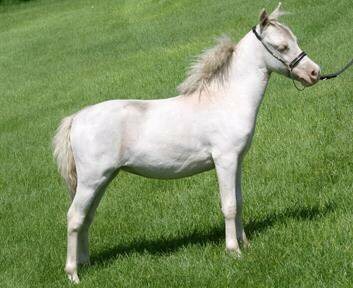 This is the type you can win with and then with her pedigree, she will have top quality foals. Her sire is our WORLD CHAMPION "Cinsational" and her dam is a DIRECT DAUGHTER OF AMHA WORLD CHAMPION, the famous" BTU !!!!!! We love what these BTU daughters produce in our select herd....... The dam to this filly is ultra-refined and Ima Beauty Too is going to look the same way. 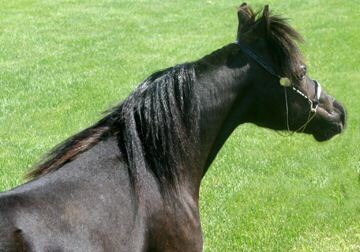 Her dark vivid sooty buckskin color is sure to capture the judge's eyes. Some of these pictures are in her 'winter woolies'....just think what she will look like upwrapped in the spring! Her canon was 7.5. Ravenwoods Medalions Empresslick d text. Hunt House Farms Medalion d text. This absolutely beautiful stud colt was a total surprise. His dam is Buckeroo JJ. 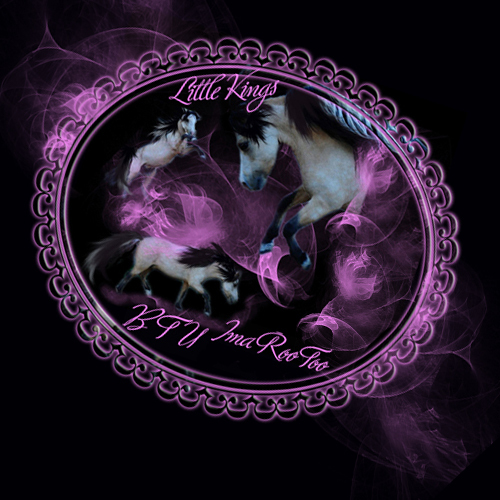 We thought we would test the BTU line--we bred JJ, our BTU daughter to our BTU son, LK BT Galaxy!!!!! This is the result. Were we shocked and everyone else that watched his exciting birth!! 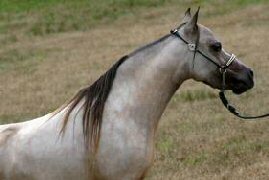 He is a loud buckskin, will have him tested soon, and find out what color genes he is carrying, but oh what a beautiful package. His canon was 8.25", so should be a top show stud, and then with his OUTSTANDING PEDIGREE, continue on for you as a great breeding stud!! He will be double registered. 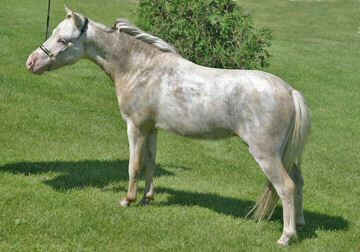 There are not many double bred foals like him with his unique coloring. Think what he can do for you!!! SOLD! Congrats to Hang Em High Ranch, on this unique double bred BTU Colt. ARE YOU SHOPPING FOR THAT PERFECT FOAL??? 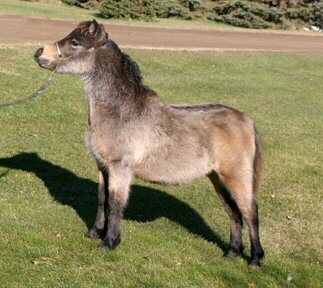 The one that WILL BE SURE TO BECOME A WINNER IN THE SHOW RING??? 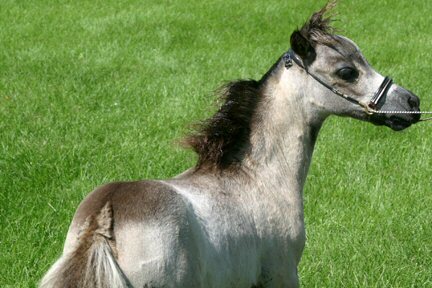 Stop then, this is the foal for you. 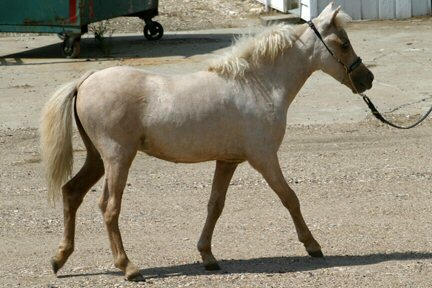 Tiny buckskin stud colt, dam is Czarina on our mare page, 2007 AMHA Reserve World Champion and holds many many other titles too numerous to list. 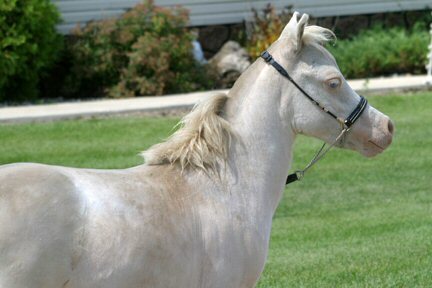 This guy is sired by our exquisite tiny buckskin stud, "Ravenwood Medalion No Laffin Matter" aka "Joker". This stud was AMHA Reserve World Champion, his sire was WORLD CHAMPION, this little guy's dam has the famous BTU, King Supreme and White Russian in her pedigree. Need we say more? 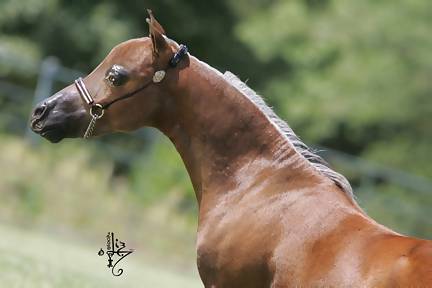 This is a very very special little stud colt, attitude to burn, total correctness and just perfect, with a long long neck, beautiful shoulder, tiny tiny baby doll head, huge eyes, and a perfect modern topline. Believe us, this is the ONE FOR YOU IF YOU ARE A SERIOUS BREEDER. AMHA/AMHR. He will mature slightly under 30 inches or in that area. Sold to Sheryll Fike From Fike Miniatures ND. 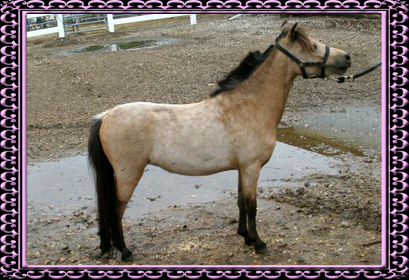 SPECIAL YEARLING STUD COLT BUCKSKIN-TINY-ALL BUCKEROO--this is a special colt you don't get a chance to own very often. 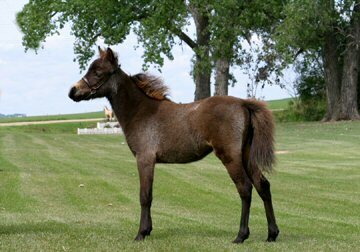 FULL brother to our MULTI WORLD CHAMPION mare BTU SHEZA DANDY, this beautiful tiny buckskin stud colt is measuring at 28." and is remarkable!! WORLD FAMOUS ---BTU-- is his SIRE--DAM is famous BUCKEROO DAUGHTER-PRETTY WOMAN, that leaves nothing more to say. Look at his beauty. We love him. 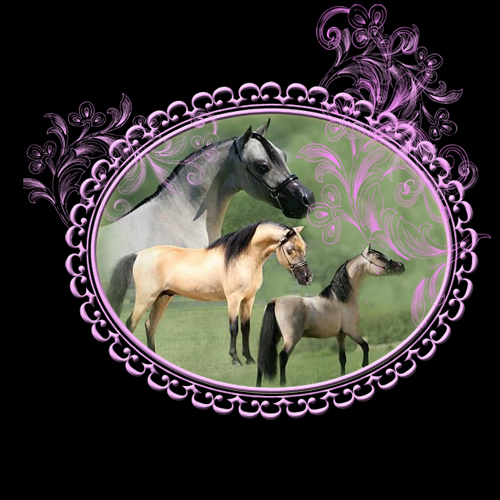 We own three daughters from this same mare, and they are all marvelous.
! Congrats to Daniel and Jennifer Hinckley, from Idaho Falls, Idaho. It was a very hard decision to sell this outstanding stud. We know Roo (Pretty Boy} is going to a great home that will appreciate his top quality and pedigree and enjoy his beauty. We have 14 BTU daughters, so felt we had to let him leave, but he will stay in our hearts forever.